We continue our series on the top draftable players entering the 2013 season. Today we discuss the tight ends. The New England Patriots showed the league what can be done if you have two outstanding tight ends. The NFL is a copycat league and now everyone wants to use multiple tight end formations. This is our list of the top 5 tight ends for the 2014 draft. Austin Sefarian-Jenkins was a 3rd team All-American and 2nd team All-PAC 12 in 2012. His 69 receptions led the country among tight ends. 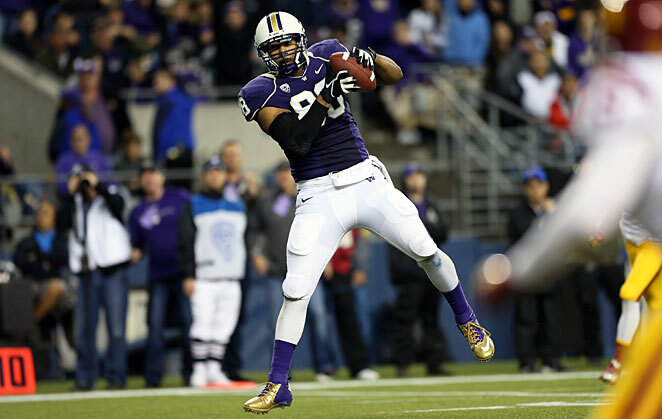 His career totals of 110 receptions, 1,388 receiving yards and 13 TD are school records for the Huskies. Sefarian-Jenkins has good size at 6’6” and 267 pounds and he has good movement skills and body control. His size makes him tough to defend, especially in the red zone. He plays tight end like a low post basketball player. A massive catch radius makes him an easy target for quarterback Keith Price. He needs to work on his blocking off the line of scrimmage, but he does a good job blocking in space. Sefarian-Jenkins was suspended in March, due to a DUI. He joined the team during fall practice, however he injured his pinkie and may lose some games at the start of the season. I’m sure NFL teams will be doing their research on the DUI incident. If he can convince them it was a one-time incident, he should be the first tight end drafted. I hope the pinkie injury is something that doesn’t sideline him for a while. He is a big part of what Washington does offensively. Colt Lyerla is a versatile player that plays all over for the Ducks. Every starting tight end for Oregon since 1987 has played in the NFL and Lyerla has a great chance to continue that streak. He is a former running back with freakish athleticism. At 6’5” and 238 pounds, he may be more of a fullback/H-back at the next level. Lyerla has soft hands and knows how to get open. He does a good job running drag routes over the middle and will lower his shoulder to take on defenders. Oregon uses him in a variety of ways, even as a running back. NFL teams will love the match-up problems that he creates. Lyerla has a good football IQ and works well with the quarterback, especially when the QB is under pressure. Many people have compared what Lyerla does on the football field to what Aaron Hernandez did for the Patriots. Look for Oregon to play him all over the field and improve his draft stock this year. Eric Ebron is an athletic pass-catching tight end that is beginning his second year as a starter. His 40 receptions and 625 receiving yards were school records and he was a 2nd team All-ACC selection. He has good speed and burst to create separation between himself and the defender. He has long arms and the body to box out on passes over the middle. Ebron is a physical blocker that drives defenders off the line of scrimmage. He has a great combination of strength and athleticism. A tight end that can truly block and catch is becoming a rare thing and NFL scouts will love this guy. Jacob Pedersen is a versatile player that is beginning his third year as a starter. Wisconsin is known for excellent tight ends and Pederson carries on that tradition. He was a 1st team All-Big Ten selection last season and he has 12 TD’s in the last two years. Pedersen has not put up huge numbers due to the run first offense at Wisconsin, but he is a dependable receiver that can move the chains. He is a willing blocker, but he could improve in that area. Pedersen has good hands and is likely to be a fullback/H-Back at the next level. At 6’7” and 265 pounds, C.J. Fiedorowicz has the type of size that NFL teams love. He is a huge target that catches the ball well in a crowd. When the quarterback is in trouble, Fiedorowicz can be his best friend. Iowa struggled offensively last year, but Fiedorowicz was the lone bright spot for the Hawkeyes. He began his career in Iowa as strictly a blocking tight end, but he has increased his receiving numbers every year, last season catching 45 passes. This entry was posted on August 18, 2013 by draftmaniacs in Top 5 at each position and tagged 2014 NFL draft, Austin Sefarian-Jenkins, C.J. Fiedorowicz, Colt Lyerla, Eric Hebron, Iowa Football, Iowa Hawkeyes, Jacob Pederson, NFL Draft, North Carolina football, North Carolina Tarheels, Oregon Ducks, Oregon football, Tarheels football, Washington football, Washington Huskies, Wisconsin Badgers, Wisconsin football.